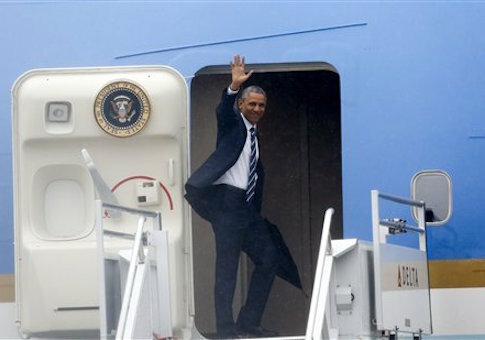 President Obama’s Earth Day Air Force One flights cost taxpayers with more than $800,000, according to newly released documents by Judicial Watch. The documents, obtained using the Freedom of Information Act, show Air Force One runs a cost of $206,377 per hour to operate. Obama’s trips to and from Miami to deliver his speech in the Florida Everglades totaled 4.2 hours, costing taxpayers $866,615.40. Additionally, Air Force One used 9,180 gallons of jet fuel. During Obama’s Earth Day speech, he assailed Republicans on global warming. "The irony of using Air Force One for an unnecessary jaunt to discuss global warming aside, these documents show that taxpayers are being gouged for President Obama’s abuse of the perks of office," said Judicial Watch president Tom Fitton. "Taxpayers should not be forced to foot the bill for his continual savaging of political opponents." Using FOIA’s and subsequent lawsuits, Judicial Watch discovered the Obamas and Bidens have spent more than $40 million in taxpayer dollars on trips since 2009. This entry was posted in Politics and tagged Air Force One, Barack Obama, Green Energy. Bookmark the permalink.